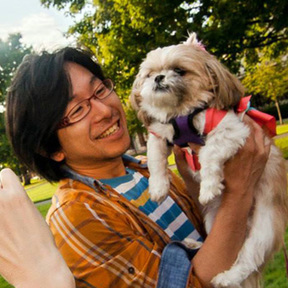 Learn Sashiko Online - Whenever you can & Wherever you live. We offer Sashiko Stitching Workshop in NYC and the US Eastern Coast. We tried several "Sashiko Online Workshop" to share the similar experience online. I had a lot of fun, and I believe everyone was happy about the online workshop. Although all of the workshops completed as very successful events, it has been challenging for us to schedule an online workshop for the time everyone can join with overcoming the time differences, busy schedules, and locations. The previous online workshop was "Real-time (Live-Style)" workshop and the participants had to stay in front of the PC and web-cam for the whole workshop hours. Thank you for being patient with me. 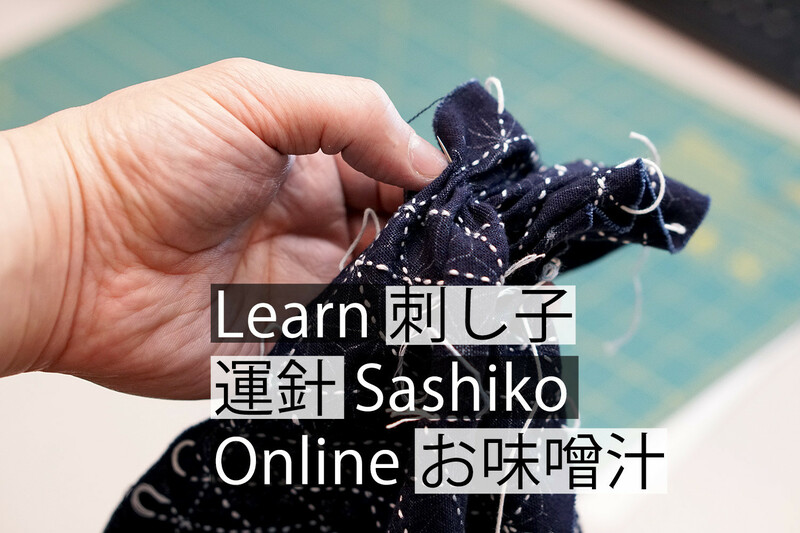 Here is a new journey of online Sashiko Workshop. 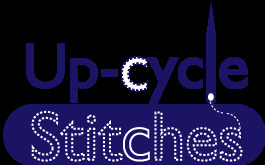 This is the Online version of Sashiko Stitching Workshop (Core & Basic). If you have taken Atsushi's workshop in NYC (the one more than 3 hours length), you will not get much new things to learn from this Online Sashiko Class. Please wait for the periodical monthly Sashiko continuous kit. You are welcome to take it again. 1. Please expect a package of all the materials from Atsushi or Keiko. The contents of the provided materials are listed below. If you already have purchased some of the items, like a set of the thimble and the needles, please let me know. If you do not need the new set, I will give you a in-store credit so that you can use for the future purchase. 2. I will send you the links to the videos for the workshop. The workshop videos consists of 3 parts on Vimeo. A - Understanding Sashiko - Lecture of Sashiko history and background. C - Sashiko Stitching Basics - How to proceed & enjoy Sashiko stitching with Asano-ha pattern. In order to fully understand & enjoy Sashiko, we strongly recommend watching all the videos in order of A→B→C. The Part (B) is the most important section in the Online Sashiko Class. Sashiko is not about making one good stitch, it is about moving the needle as you feel, then you will see many beautiful stitches. How to apply Sashiko to Visual Mending. Again, this workshop is a online version of 3 hours+ workshop I do in NYC to share the Basic and Core of Japanese Sashiko we practice. You will learn how to use the thimble, the needle, and move them with rhythm as we do. I will, of course, answer any kinds of questions regarding Sashiko. I am planning to provide the extra Online Sashiko Classes (like a subscription) for other topics that I have mentioned above. In order to attend any other Sashiko classes, this Online Sashiko Class will be the prerequisite. 3. Join one of the "Online Sessions" to meet Atsushi, and make sure you learned the "core" of Sashiko stitching. We will check you hand-posture. It will be like a type of Online Workshop. Please read the procedure of "How to prepare to join the Online Session" and make a reservation for the date and time you would like to participates. The session will be about 30 to 60 minutes, focusing on each participants. The 3 steps will complete the Online Sashiko Class. You will receive one ticket to join "Sashiko Online meeting (Live-Style)" . Most of the questions can be answered by the Online Session, but I understand that the questions will be keep coming up even after that. As of 2019 Spring, the Question Forum and Sashiko Online Meeting is free of charge for those who participated the Online Sashiko Class or the workshop in NYC/NJ (requiring Facebook account, as of now). Until I set up everything, I will answer the questions personally, so you won't be puzzled in nowhere. *If it is extremely difficult to join the Online Session, I also understand that. In that case, the participant can send me a video of him/her stitching as I introduced in the workshop. The person has a year to join the Online session or to send me a video for checking. I am afraid but the prerequisite will not be effective until Atsushi actually confirm the stitching the way the participant does. Please take a moment to read the notes below. Your contribution to maintain the Online Sashiko Class is very much appreciated. The videos for the Sashiko Online Class are available for a year starting from the day you sign up. Not available for Download (so please don't try). After the first year, I am planning to ask participants to pay a small fee, if you are still interested. This fee will be used to keep us update the workshop videos & use the video-chat platform (as of now, we use "zoom'). Please respect the copyrights. Once you complete your registration, we will send you a password to access the video.s We will also add you the the specially designated mailing list for the Online Sashiko Class subscribers. I will change the password every month, so please make sure that you receive the email from us. It is my goal to share Sashiko to as many people as possible. I even feel that, If I get a patron who covers all of my expenses, I would like to offer the workshop free. Until that, you as the participant are the patron for our journey. I am scared. : The last thing I would like to experience is that someone "who doesn't understand what we do" watching the tutorial-videos and get "what they want to learn" instead of "what I would like to share with." Unfortunately, we as human tend to listen to only the things we would like to listen, and see only the things we would like to see. It is the risk I was thinking over and over if I should offer the Online Sashiko Class like this. I do not want to spread only the "quick technique of Sashiko". What I would like to deliver is the whole experience of mindful, beautiful, and fulfilling Sashiko. Your support to maintain the Sashiko community without misunderstanding & misuse of what we are proud of would be very much appreciated. It is my first time to offer this type of class online. It took about a year to overcome the fear to be in public like this. Therefore, please read everything I explained on the website here and "Terms' and Condition" to avoid any unfortunate misunderstanding. There is a big discount (almost 50% off) for those who agrees to be the trial students for the trial period. Please check this link to find more detail. Workshop Materials Contents - We will send them. *Free regular shipping for the US residence. The shipping upgrade is available. Please expect a follow-up email (from Atsushi's gmail account) for the international shipping (Outside of USA) so I can send you the separate Paypal invoice for the actual shipping fee. Thank you for understanding. Cotton Poplin Fabric (for back fabric usgae) / 24.5" x 11"
Fusible Interfacing | 24.5" x 11"
For section.3: One ticket to join the Sashiko Online Workshop (Live-style) - "checking up" version will be provided over email. (Please confirm the schedule once you join the google group. I share the schedule with Google Calendar. The duration is 30~120 minutes depends on the questions from the participant). Support from Atsushi for any questions regarding Sashiko Workshop over the email will be available. I believe I have explained everything. Again, please read another article about the "Sashiko Online Workshop - Term and Condition" to fully understand what I would like to do. Thank you very much for your understanding.